Perfect start for Team Fensport! On the 1st round of the RRG Toyota Sprint Series saw team Fensport claim 1st & 2nd Overall. The day started wet and cold and it was Stan who took the initiative fitting wet weather tyres and grabbing the lead from the 1st run. By lunch time Stan had an impressive early lead of nearly 2 seconds. Adrian in the Fensport GT86R opted to stay on dry tyres and await the better afternoon weather, tip toeing and slithering around the track he was down to 6th place at lunch time. It would all hinge on the weather! 1st runs after lunch saw the times tumble, Adrian taking a full 10s of his previous best and grabbing the lead, Stan more cautious and slipping to 3rd. The track was drying quickly and everyone was going faster with each run. Stan regained the lead on run 6, but it was short lived as Adrian settled in and went faster with each run to claim 1st overall. His time was incredible, a massive 3.66 seconds faster than last year’s record! Stan also an incredible result and a similar 4.07s faster than his previous best. “It still looks like the same car but the Fensport GT86R has undergone quite a transformation over the winter! We now have a prototype Avo stage 5 ball bearing turbocharger, with larger intercooler and pipe work. We were experiencing boost and power drop off last year and this setup has completely cured the problem. Boost is now 1.5 bar in the higher gears and will hold right to redline. The fuel system has also been upgraded to include an Avo in tank pump holder and Fensport dash 8 custom fuel system. Also loving the new Toyo R888R tyres, they have a stiffer carcase and offer better directional change along with more overall grip, definitely needed with the power increase! The engine bay has been refreshed with new intercooler pipework and Samco blue hoses. New 2.1 litre HKS forged engine rebuild with Avo stage 3 turbocharger conversion and water injection system. The fuel system has also been upgraded with a high flow fuel pump and 540cc injectors. Avo oil cooler and a baffled alloy sump and breather system has been fitted to cope with the high G forces. Similar 2016 engine calibration using Ecutek software to include electronic boost control and in gear / throttle dependant boost control. Also the new Toyo 888R tire, we managed to get the 255/40/17 on all round, the handling and balance is fantastic. The GT86R will be on display at Japfest Silverstone on the 24th April, The car will be displayed on the Toyo Tires stand. Both cars will be competing in the RRG Toyota Sprint Series on the following dates. Fensport have campaigned a 2 car team in this year’s Toyota Sprint Series. Adrian Smith driving the familiar Fensport GT86R and also Stan Hawrylak driving a similar but normally aspirated GT86. Adrian driving the GT86R takes the overall championship win, with Stan taking a class win and a superb 2nd overall. As you can imagine the team are ecstatic with the result and couldn’t of wished for a better year. “Wow what a year, the racing has been so much closer this year, making this championship win, one to remember! Power output is now around 470bhp and the car has performed fantastic all year. “It all started back in 2014 after speaking with Adrian and his team at Fensport, I knew I wanted to work with them after I had finished 3rd overall in last year’s championship. The team took me under their wing and have transformed my car turning it in to a full blown racer, stripped, Cusco roll cage, seats and harnesses were fitted along with new BC coilovers and the full range of Summit and Swave chassis parts. Power has been increased to around 230bhp with Ecutek Race Rom and using a HKS manifold, Miltek exhaust system, lightweight pulleys, flywheel and carbon propshaft the car has been incredible and a dream to drive all year! “I had a similar poor start to Adrian at the 1st event also running the wrong tyre for the conditions, it was Blyton in the dry where I could finally attack and see how good this new car was and claim a healthy 6th overall and 1st in class. For round 3 was my 1st podium finishing in 3rd, round 4 was my best result of the year going one better and I was so pleased to finish 2nd overall. Round 5 at Blyton was tough with 3 turbocharged cars ahead 4th was another good result! A Fensport 1-2 was the dream we had hoped for at the beginning of the year!! A big Cheers and thank you to all our helpers and sponsors throughout the year! We are pleased to announce the Fensport GT86R wins 1st overall at Round 4 of the RRG Toyota Sprint Series, making 4 wins from 4 rounds so far. The 2nd round of this year’s championship was held a RAF Woodbridge in Suffolk. The airfield track is a favourite amongst the drivers as it is a technical yet high speed 2.2 mile circuit with plenty of fast sections.After our previous win at round 1 we were upbeat about overall success on the longer Woodbridge track. The GT86R only had engine mapping and software changes, made using the Ecutek software, we have developed 3 different engine maps with low, medium and high boost levels. The car on low boost is running around 420bhp so medium and high were to be only used if needed! The day was perfect for the rear wheel drive GT86R, 20 degrees, bright and dry and the 2 practise runs went very well. On to the 1st timed run and Adrian was only 4 corners from the end when disaster struck! The GT86R broke a rear driveshaft! It wasn’t worth continuing the run so it was straight back to the pits. With no spare driveshaft on site, it was Jay Smith, a very very good friend, who came to the rescue loaning us his shaft from his road car! We missed run 2 whilst the driveshaft was changed in readiness for run 3. With 2 rounds down and 2 wins under our belt, we are really looking forward to round 3 which is held at Blyton Park on the 20th July. We have a few changes to make prior to the next round, new stronger driveshafts, a baffled sump and some improvements to the cooling system are the next modifications. If this all goes well, we may get to use one of those higher power maps! 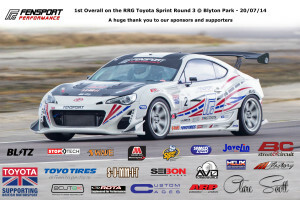 Fensport New GT86R 1st Overall on its debut outing!! Team Fensport have been very busy modifying the GT86R over winter, completely transforming the car, new additions include the stunning new wide arch Blitz Aerospeed kit which allows an extra 120mm of track width on the rear and also allows room for the new Rota 18 x 9.5″ wheels which are clad in 265 wide Toyo R888’s all round. Additional aero parts include new front and rear canards, TRD aero fins, higher rear wing and a custom rear diffuser. With the new found grip the team have increased spring rates on the BC Racing coilovers and also upgraded the Avo turbocharger to the billet version which offers the same incredible response alongside a 20% increase in airflow. The car has also been re mapped using Ecutek software to get the most out of the 108 ron race fuel, along with electronic “in gear” boost control which helps with traction in the lower gears. The car is still using a completely standard engine and gearbox. The car was finished just in time for a test session the day before the 1st race event at Blyton and the team were excited to be back at the track. After just a few runs the suspension was adjusted, tyre pressures checked and Adrian reporting back “this car is just incredible” which was more than enough for the team to be encouraged and look forward to race day. Blyton Park is a fabulous track, fast and open with long sweeping 4th and 5th gear corners and plenty of “run off” so you can be very brave! The track should suit the new GT86R very well. The morning practise runs were another chance just to fine tune the suspension settings and our very first run confirmed our expectations with a safe 1:11.39 run putting the GT86R straight to the top of the leader board! As the day progressed the team finely tuned tyre pressures and shock absorber settings and picked up speed all day long with many 1:10s runs. Adrian who was really enjoying the new car’s handling and power went for a big push on the final run to record a stunning 1:09.43 and take the overall win. ” The new aero and power have turned the GT86R in to a serious contender for this year’s championship! The car is just incredible to drive, corner speed is amazing …. you have to almost re-programme your brain … you really are going that fast! The new turbocharger has really improved the power and is very easy to control the car with the Ecutek software and boost control … it’s a dream! The team were ecstatic with the car’s performance and are really looking forward to Round 2 at Woodbridge on the 15th June.